Lock in a great price for Malama Beach Holiday Village - rated 8.8 by recent guests. Very friendly staff, a spacious room, very clean, beach nice and warm, very comfortable for a vacation with a child. Our personal highlight - a nice beach bar / restaurant by the sea (not part of the hotel). Very helpful friendly staff - receptionists, breakfast staff, pool attendants, bar staff, entertainment, exercise & cleaners. You can recommend this hotel for couples and families with children. For youthful recreation can seem a little boring, but if you are looking for a quiet secluded vacation then you are here. The hotel consists of many small villas scattered over a fairly large area. A huge advantage of this hotel can be called a chic bay, but if you like to swim alone, then you need to choose a time around 6 am or 9 pm. The rooms resemble small apartments with a bedroom and a hall combined with a kitchen, there is everything necessary for life. In the evenings, the pool has an entertainment program for children and adults, and the sea itself has a bar where you can spend an evening. 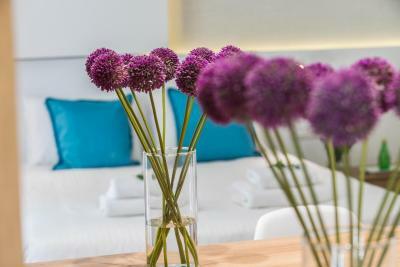 Room modern and spacious with direct acess to the property's beautiful gardens from our veranda. Beautiful location on the beach. Very friendly staff. A fantastic location next to a picturesque beach. Has a relaxed feel and in excellent condition with well maintained gardens between the accommodation blocks. All the benefits of a hotel with a village layout. Two good size pools and managed allocation of sun beds. Buffet breakfast had a good choice of cooked and cold items. Many guests seemed to be on all inclusive but there are plenty of excellent local restaurants and shops. Recommended for family stay. The staff was really friendlyespecwith hi,.ially Mr, Dimitris at the pool bar as well as the girl working with him. 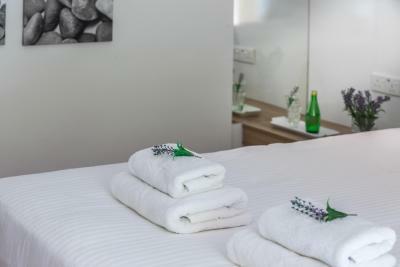 Excellent facilities bu t you need to provide the all iclusive package to cypriots as well. Right on the beachfront, Malama is set in a mature garden with palm trees. It offers an outdoor pool, 2 restaurants and 3 bars only 40 minutes’ drive from Larnaca Airport. 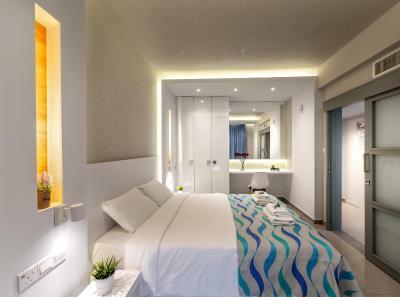 All suites at Malama Holiday Village feature an en suite bedroom, living room and kitchen. 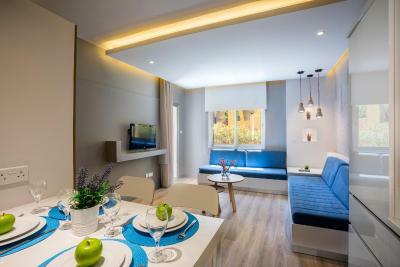 Each unit is air conditioned and has a balcony with views over the garden or the Mediterranean Sea. Certified Cypriot breakfast is served in the morning. Guests can enjoy a cocktail in Le Repos lounge or grab a snack at the poolside bar. Malama Village offers an indoor pool and hot tub located in an exotic cave. Sports activities at the resort include squash, tennis, archery and scuba diving. For younger guests from 4 to 11, there is a kids' club operating 6 days a week under trained staff, as well as a grassy playground and a separate children’s pool. Baby-sitting services upon request and a special children’s menu are also available. The hotel provides free private parking on site and free internet at the reception area. 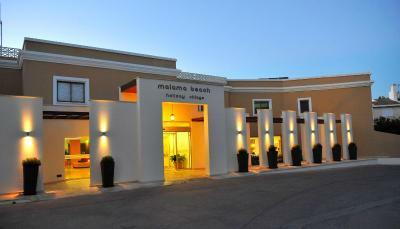 Malama Beach Holiday Village has been welcoming Booking.com guests since 1 Sept 2010. When would you like to stay at Malama Beach Holiday Village? 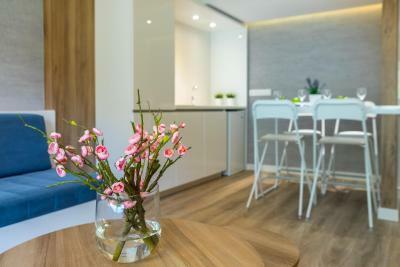 Modernly decorated suite with a kitchen, dining area, living room with a satellite TV, and a private balcony with garden views. Free WiFi is available. A safe is provided upon extra charge. 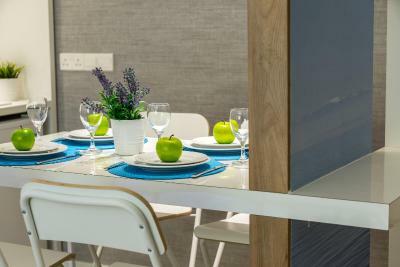 Modernly decorated apartment with a kitchen, dining area, living room with a satellite TV, and a private balcony. Free WiFi is provided. 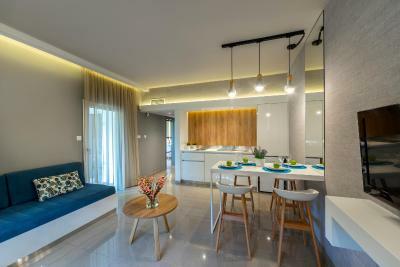 Modernly decorated apartment with a kitchen, dining area, living room with a satellite TV, and a private balcony. 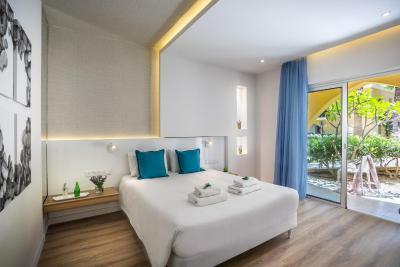 This modernly decorated room opens to a private balcony with sea views. It also offers free WiFi and a satellite TV. 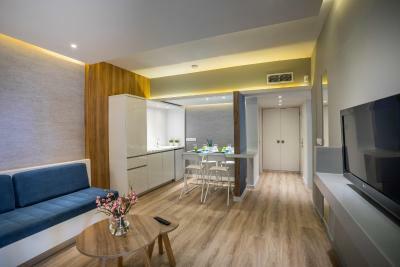 Modernly decorated suite featuring a kitchen, dining area and living room with a satellite TV. It opens to a private balcony with garden views. Free WiFi is provided. 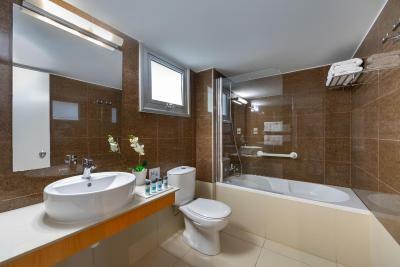 Modernly decorated suite with a kitchen, dining area, living room with a satellite TV, and a private balcony. A safe is provided upon extra charge. Free WiFi is available. Malama is a uniquely designed holiday village, located right on the beachfront in the prime resort area of Protaras. The Village is set in 26 acres of mature and beautifully landscaped gardens and offers very spacious and fully equipped suites. Malama has undergone extensive renovation over the last 4 years of the common areas (entrance & lobby, lounge, main restaurant, pool area, gym) and all the suites (including fully refitted bathrooms). House rules Malama Beach Holiday Village takes special requests - add in the next step! Malama Beach Holiday Village accepts these cards and reserves the right to temporarily hold an amount prior to arrival. Guests are kindly requested to show their credit card upon check-in. Credit card details must be the same as shown at the booking confirmation. This property serves traditional Cypriot breakfast certified by the Cypriot Tourism Organisation. The bed was quite noisy, the food was rather average (breakfast good, dinner ok, lunch canteen-like, coffee poor), the swimming pools surprisingly cold. Would have liked pool to open at 9.00am for a morning swim before breakfast! Location No personal beach. It disappointed me as on hotel pictures it seems different. So you have place only near pool and have to walk to sea. Not very convenient. No room cleaning on Sunday, beach/pool towels not exchanged daily. No option for dinner other than buffet. Cockroaches in the room, unfriendly staff, non working ac.